PYTHON was a monstrous dragon-serpent set by Gaia (the Earth) to guard the sacred oracle of Delphoi (Delphi). According to some the creature was born from the rotting slime left behind by the Great Deluge. When the god Apollon laid claim to the shrine, he slew Python with a volley of a hundred arrows. The oracle and festival of Delphoi were afterwards named Pytho and Pythian from the rotting (pythô) corpse of the beast. Some say Apollon slew the monster to avenge his mother Leto who had been relentlessly pursued by the dragon during her long pregnancy. Python was variously described as a male or female Drakon. The Homeric Hymn to Apollo--and some ancient Greek art--equates her with Ekhidna (Echidna), a half-woman, half-serpent drakaina which consorted with the giant Typhoeus. 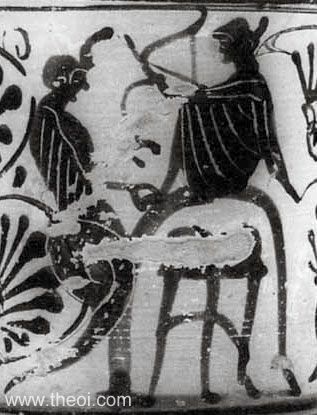 In the image right, Apollon, seated upon the omphalos stone at Delphoi, slays Python with his arrows. Here she is depicted as Ekhidna, a she-serpent with a woman's head and breast. Thus said Phoibos, exulting over her : and darkness covered her eyes. And the holy strength of Helios (the Sun) made her rot away there; wherefore the place is now called Pytho, and men call the lord Apollon by another name, Pythian; because on that spot the power of piercing Helios made the monster rot away." "But near by [Delphoi (Delphi)] was a sweet flowing spring, and there with his strong bow the lord, the son of Zeus, killed the bloated, great Drakaina (Dracaena), a fierce monster wont to do great mischief to men upon earth, to men themselves and to their thin-shanked sheep: for she was a very bloody plague. She it was who once received from gold-throned Hera and brought up fell, cruel Typhaon [Typhoeus] to be a plague to men." "[The mythical musician] Olympos was the first to use the Lydian mode, when he played on his pipes a lament for the Python." "[Apollon] made his way to Delphoi (Delphi), where Themis gave the oracles at that time. When the serpent Python, which guarded the oracle, moved to prevent Apollon from approaching the oracular opening, he slew it and thus took command of the oracle." "[Orpheus] told them [the Argonauts] in song how Apollon long ago, when he was still a beardless youth rejoicing in his locks, slew the monster Delphyne [Python] with his bow beneath the rocky brow of Parnassos (Parnassus)." "[Apollon prophesies while still inside the womb of his mother Leto :] ‘Not yet is the tripod seat at Pytho my care; not yet is the great serpent [Python] dead, but still that beast of awful jaws, creeping down from Pleistos (Pleistus), wreathes snowy Parnassos (Parnassus) with his nine coils.’"
"[At the musical contests of the Pythian Games held at Delphoi (Delphi) there were :] citharoedes, fluteplayers and citharists who played without singing, who rendered a certain melody which is called the Pythian Nome. Now the melody was composed by Timosthenes, the admiral of the second Ptolemy . . . and through this melody he means to celebrate the contest between Apollon and the Drakon (Dragon), setting forth the prelude as anakrousis, the first onset of the contest as ampeira, the contest itself as katakeleusmos, the triumph following the victory as iambos and daktylus, the rhythms being in two measures, one of which, the dactyl, is appropriate to hymns of praise, whereas the other, the iamb, is suited to reproaches (compare the word iambize), and the expiration of the Drakon (Dragon) as syringes, since with syringes players imitated the Drakon as breathing its last in hissings." "[According to Ephoros (Ephorus), a C5th B.C. Greek historian, who rationalised the Python myth :] Apollon, visiting the land [of Phokis (Phocis)], civilized the people by introducing cultivated fruits and cultured modes of life . . . when he arrived at the land of the Panopaians he destroyed Tityos (Tityus), a violent and lawless man who ruled there; and the Parnassians joined him and informed him of another cruel man named Python and known as the Drakon (Dragon), and that when Apollon shot at him with his arrows the Parnassians shouted ‘Hie Paian’ to encourage him--the origin, Ephoros adds, of the singing of the Paian (Paean) which has been handed down as a custom for armies just before the clash of battle--; and that the tent of Python was burnt by the Delphians at that time, just as they still burn it to this day in remembrance of what took place at that time. But what could be more mythical than Apollon shooting with arrows and punishing Tityoses and Pythons, and travelling from Athens to Delphoi (Delphi) and visiting the whole earth?" "The most widespread tradition [for the naming of Pytho in Phokis] has it that the victim of Apollon's arrows rotted here, and that this was the reason why the city received the name Pytho. For the men of those days used pythesthai for the verb ‘to rot’ . . . The poets say that the victim of Apollon was a Drakon (Dragon) posted by Ge (Gaea the Earth) to be a guard for the oracle. It is also said that he was a violent son of Krios (Crius), a man with authority around Euboia (Euboea). He pillaged the sanctuary of the god, and he also pillaged the houses of rich men. But when he was making a second expedition, the Delphians besought Apollon to keep from them the danger that threatened them. Phemonoe, the prophetess of that day, gave them an oracle verse :--‘At close quarters a grievous arrow shall Apollon shoot at the spoiler of Parnassos (Parnassus); and of his blood-guilt the Kretans (Cretans) shall cleanse his hands but the renown shall never die.’ It seems that from the beginning the sanctuary at Delphoi (Delphi) has been plotted against by a vast number of men. Attacks were made against it by this Euboian pirate." "When Apollon and Artemis had killed Pytho they came to Aigialeia [Sikyon (Sicyon)] to obtain purification." "The Kretans (Cretans) say . . . that Karmanor (Carmanor) [of Krete (Crete)] purified Apollon after he killed Pytho." "When Apollon and Artemis had murdered Python they came to Aigialeia [Sikyonia (Sicyonia)] for purification." "The people of Epeiros (Epirus) maintain that the [sacred] Drakones (Dragon-Serpents) [of their temple of Apollon] are sprung from the Python at Delphoi (Delphi)." "Apollon organised funeral games in honour of Python [the Pythian Games of Delphoi]." "From Terra (Earth) [Gaia] [was born] : Python a divine snake." "Latona [Leto] was borne there [the island of Ortygia] at Jove's [Zeus'] command by the wind Aquilo [Boreas], at the time when the Python was pursuing her, and there, clinging to an olive, she gave birth to Apollo and Diana [Artemis]. This island later was called Delos." "Python, offspring of Terra (the Earth) [Gaia], was a huge Draco (Dragon) who, before the time of Apollo, used to give oracular responses on Mount Parnassus. Death was fated to come to him from the offspring of Latona [Leto]. At that time Jove [Zeus] lay with Latona, daughter of Polus [Koios (Coeus)]. When Juno [Hera] found this out, she decreed that Latona should give birth at a place where the sun did not shine. When Python knew that Latona was pregnant by Jove, he followed her to kill her. But by order of Jove the wind Aquilo [Boreas] carried Latona away, and bore her to Neptunus [Poseidon]. He protected her, but in order not to make voice Juno's decree, he took her to the island Ortygia, and covered the island with waves. When Python did not find her, he returned to Parnassus. But Neptunus brought the island of Ortygia up to a higher position; it was later called the island of Delos. There Latona, clinging to an olive tree, bore Apollo and Diana [Artemis], to whom Vulcanus [Hephaistos (Hephaestus)] gave arrows as gifts. Four days after they were born, Apollo exacted vengeance for his mother. For he went to Parnassus and slew Python with his arrows. Because of this deed he is called Pythian. He put Python's bones in a cauldron, deposited them in his temple, and instituted funeral games for him which are called Pythian." "When Tellus (the Earth) [Gaia] deep-coated with the slime of the late deluge, glowed again beneath the warm caresses of the shining sun, she brought forth countless species, some restored in ancient forms, some fashioned weird and new. Indeed Tellus (the Earth), against her will, produced a Serpent (Serpens) never known before, the huge Python, a terror to men's new-made tribes, so far it sprawled across the mountainside. The Archer god (Deus Arctitenens) [Apollon], whose shafts till then were used only against wild goats and fleeing deer, destroyed the monster with a thousand arrows, his quiver almost emptied, and the wounds, black wounds, poured forth their poison. Then to ensure the centuries should have no power to dull the lustre of that deed, Phoebus [Apollon] founded the sacred games, the crowded contests, known as Pythian from that Serpens overthrown." "My [Apollon's] countless arrows slew but now the bloated Python, whose vast coils across so many acres spread their blight." "He [Apollon] put to rest throughout its winding coils the serpent Python, the terror of the peaceful Musae (Muses)." "Did Phoebus [Apollon] encounter savage monsters or wild beasts? A Draco (Dragon) was the first to stain Phoebus' shafts." "[The witch Medea casts a spell to summon poisonous snakes invoking the names of the greatest of the Drakones (Dragons) :] ‘In answer to my incantations let Python come, who dared to attack the twin divinities [Apollon and Artemis] . . . Let Hydra return . . . Thou, too, ever-watchful dragon [of the Golden Fleece].’"
"The god [Apollon] had smitten the dark and sinuous-coiling monster, the earth-born Python, who cast about Delphos (Delphi) his sevenfold grisly circles and with his scales ground the ancient oaks to powder, even while sprawling by Castalia's fountain he gapes with three-tongued mouth athirst to feed his deadly venom : when having spent his shafts on numberless wounds he left him, scarce fully stretched in death over a hundred acres of Cirrhaean soil, then ,seeking fresh expiation of the dead, he came to the humble dwelling of our [Argos'] king Crotopus." "He [Python] that shook the horns of sacred Parnassus, twining his coils among them, until pierced by a hundred wounds he bore, O Delian [Apollon], a forest of thy arrows." "Next [the Delphian Games] is celebrated the freeing of Phocis from the Serpent's coils, the battle of the boy Apollo's quiver." "Lilaea that sends forth the ice-cold springs of Cephisus, whither Python was wont to take his panting thirst and turn aside the river from the sea . . . quivers the god [Apollon] emptied here in countless slaughter." "A sacred place conspicuous; the place where the Pythian [Apollon] had noticed on a hill the ninecircling coil of the Drakon's (Dragon's) back, and put to sleep the deadly poison of the Kirrhaian serpent." "Zeus will not receive you without hard work, and the Horai will not open the gates of Olympos to you unless you have struggled for the prize . . . Apollon mastered Delphyne [Python], and then he came to live in the sky." "Delphoi (Delphi) : The sanctuary of Apollo. It was thus named because the serpent Delphyne [Python] was found there, the one which Apollon killed." Greek Lyric V Melanippides, Fragments - Greek Lyric C5th B.C.